Manage your warehouse rules, company settings, user settings and e-mail alerts, vendor / brand management, user permissions, and billing. 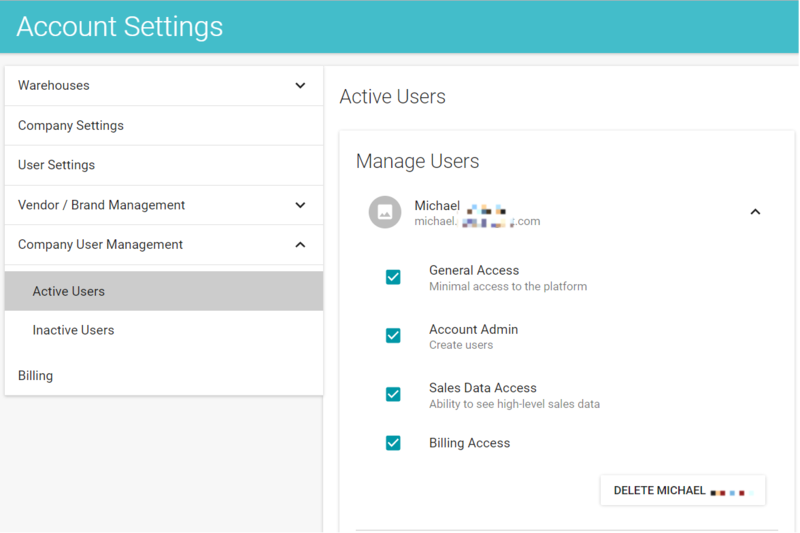 Once on the Account Settings page, you'll notice the left-hand menu allows you to access your warehouse settings, company settings, user settings, vendor / brand management settings, company user permissions, and (depending on your user permissions) your billing. The warehouses section of the Account Settings page allows you to manage your warehouse basic information, settings, address, and channel overrides (or what channel your warehouse is enabled to fulfill orders from). Basic Info allows you to manage your warehouse's name and phone number. You will also enter the Jet Fulfillment Node if you plan on using this warehouse to fulfill orders from Jet. You can set a Company Name, something that will be tracked in this section on Zentail but will not be displayed anywhere else. The Address section is where you can enter the address for each warehouse. We also include a special section for eBay Location as a specific zip code we'll send just to eBay. If your Zentail platform is integrated with SkuVault or Fishbowl, enter the Warehouse code. This is how Zentail adds inventory from your SkuVault / Fishbowl warehouse to the corresponding Zentail Warehouse. From your Channel Overrides section, you can enable or disable each warehouse from fulfilling orders to a specific channel. Channel Overrides are useful if the lead time for a specific warehouse does not meet the requirements of a certain channel. Overrides can also be used to disable FBA from fulfilling orders from Walmart. If a warehouse is disabled on a certain channel, Zentail does not include inventory from the disabled warehouse when sending inventory updates to the channel. The Company Settings tab allows you to manage a number of key features in Zentail. This includes your inventory threshold, default warehouse, and your warehouse priority list. Set your inventory threshold: a feature that helps reduce the risk of backorders for fast-moving products. The default warehouse is useful to ensure visibility of orders if you use an integration to fulfill your orders. There are situations when an order comes into Zentail for a SKU that does not exist in Zentail (it was likely created directly on the channel and never on Zentail). Those orders won't be able to follow the warehouse fulfillment priority list because Zentail doesn't have any information about the SKU, or where its inventory is. This order would still get routed to a warehouse if you have your default warehouse saved. This is a very valuable tool in Zentail. If you have inventory in multiple warehouses, where should Zentail route the order? This list allows you to set the rules within Zentail and automate your order-routing process. You can learn more about this feature here: Set your Warehouse Priority settings for fulfilling orders. This section allows you to create and edit your account's predefined package dimensions. This is useful if you have a large number of SKUs that have the same shipping dimensions (length, width, height, and weight). Once you've created predefined packages, you can quickly select them while editing a SKU under Price & Availability => Shipping. You can upload your company logo here. Your company logo is shown on Zentail pages and on packing slips generated through Zentail. Your User Settings section currently has two fields: Add a user photo and E-mail Settings. If you choose to add a photo, it will display in the Product History section of a SKU next to any actions you took. Email settings allows you to opt-in or out of e-mail notifications from Zentail. Currently, Zentail can send an e-mail notification whenever an order comes in and/or whenever an order requires additional attention. This section allows you to add or remove vendors and brands from your registry. You can learn more about this section here: Vendor / Brand Management. You'll also be able to store vendor contact information in the near future. Billing Access- This permission allows users to view the Billing section of the Account Settings page. This includes links to the invoicing system to pay for a Zentail subscription, and the ability to update your company's credit card. The API Access section of your Account Settings page allows you to view, create, and manage your API Tokens. Your API Token is a unique identifier that allows you or your developers access your Zentail account via our Open API. You can copy the active API token by clicking on the clipboard icon as shown below. You can also label the token for your reference in the label field. Please remember to keep your token secret. The Billing section gives you access to your previous and current Zentail invoices as well as the ability to update your credit card information. You can view the month, amount, and status of each invoice. You can also go directly to the billing portal from this section. Please contact your Account Admin if you believe you should have access to this section. You now have the ability to update your credit card information directly in Zentail. Within your Account Settings page, you can manage your existing labels. This includes editing the color for your labels. You can also click on any label to instantly navigate to a your QuickEdit view where you can filter by each label!